All of Grandma’s memories are special to the whole family! This uniquely designed journal gives Grandma a place to write about activities together, highlights of the day, things we learned, and words of wisdom. The space at the top of each page lets Grandma write the name and age of the special loved one she’s spending time with that day whether it be a special young friend, one grandchild, or multiple grandchildren and friends! This will truly be a treasured item for the whole family to reflect on now or when the children are grown. Treasure the memory forever! All of Grandma’s memories are special to the whole family! This uniquely designed journal gives Grandma a place to write about activities together, highlights of the day, things we learned, and words of wisdom. The space at the top of each page lets Grandma write the name and age of the special loved one she’s spending time with that day whether it be a special young friend, one grandchild, or multiple grandchildren and friends! This will truly be a treasured item for the whole family to reflect on now or when the children are grown. Treasure the memory forever! 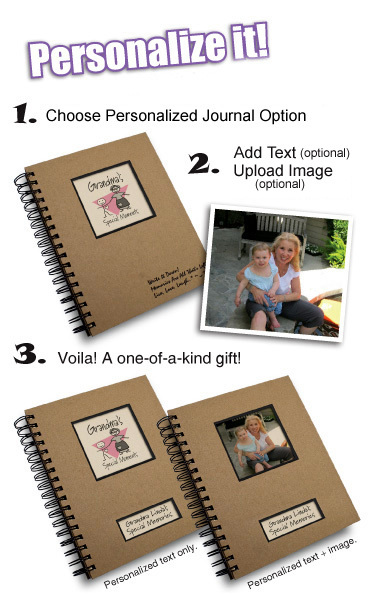 Personalize the Grandma’s Special Moments Journal with text and/or a picture.